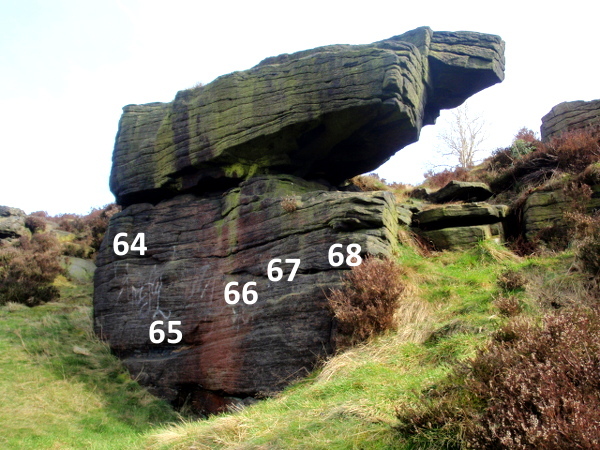 If you grab the N on the compass in the top left of the map and spin it round to the bottom you get a better view of the crag. 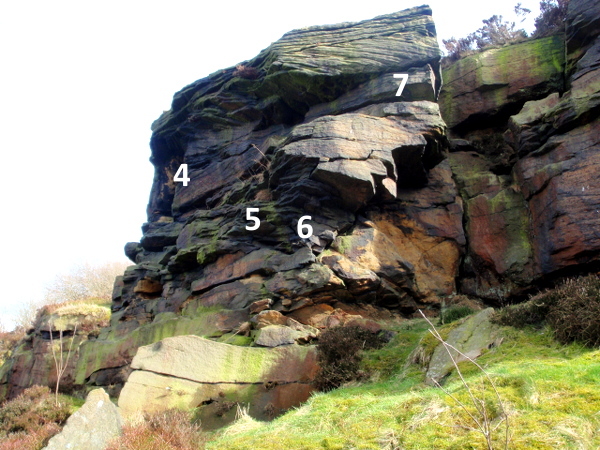 The often ignored Lindley Moor Edge has a small collection of routes and a number of low grade boulder problems strung out along a peaceful hill side with fantastic views over the Calder Valley. 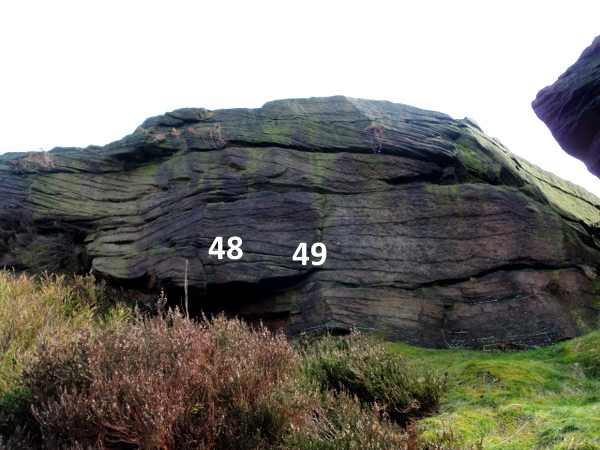 It's very easily accessible from the M62 and Huddersfield and once even had it's own dedicated, but possibly inaccurately named, guidebook "T' Nearest Crag T' College'. 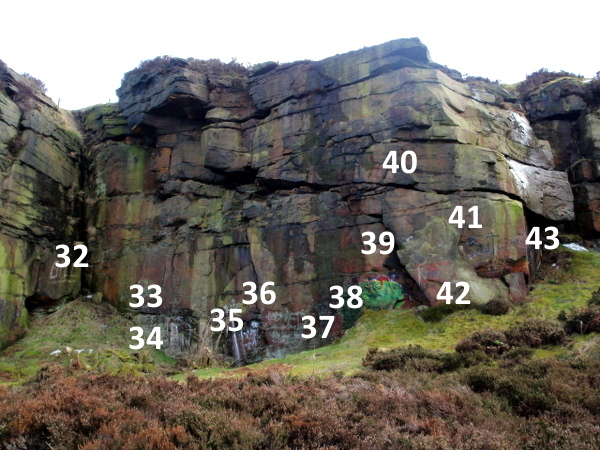 A more recent mention in the fine YMC Yorkshire Gritstone Volume 2 has resulted in a bit more attention. 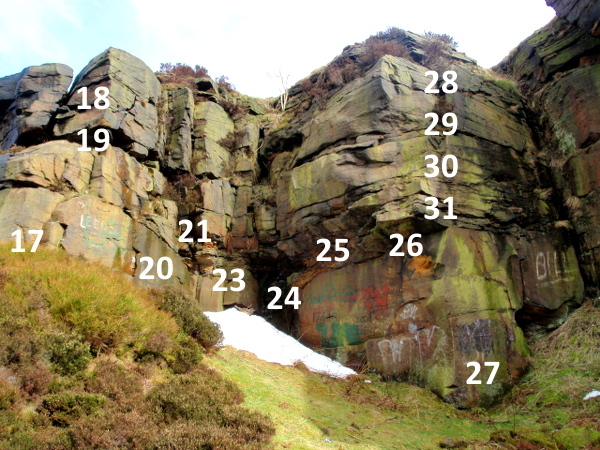 Original route/problem names from the Huddersfield Area Bouldering Guide and "T' Nearest Crag T' College' have been retained where possible although we are taking the left to right as you look at the crag approach to ordering the problems. 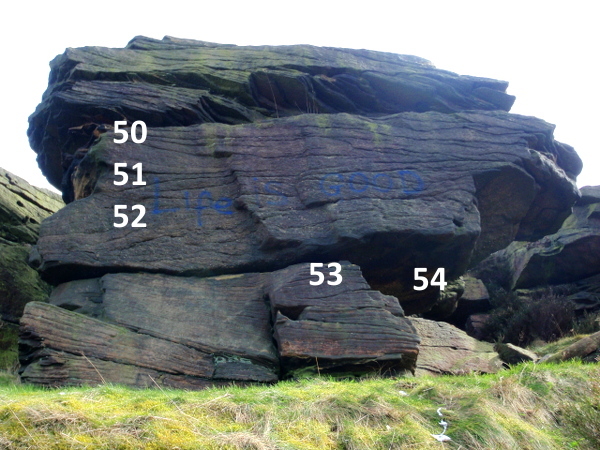 This is the most definitive guide so far, combining the all the recorded boulder problems and routes. 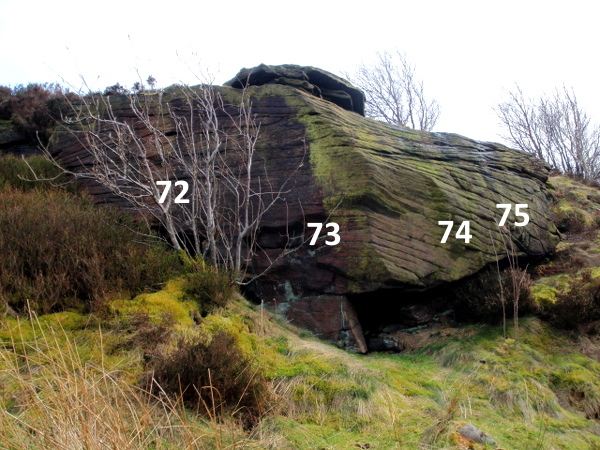 There are a load of route numbers painted on to the rocks that would appear to refer to older routes, however these are no longer documented and no-one know their origin. If anyone has any information on this we'd appreciate you getting in touch. 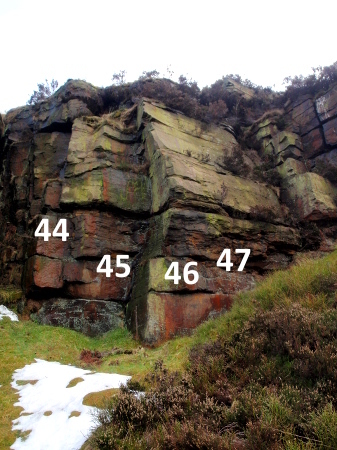 Getting to Lindley Moor Edge is easy, near the Wappy Spring pub on the A643 Lindley Moor Road there is a minor road running under a motorway bridge, go down this and carry on to the limited parking on Old Lindley Rood in small lay bys where you can walk directly up to the crag. 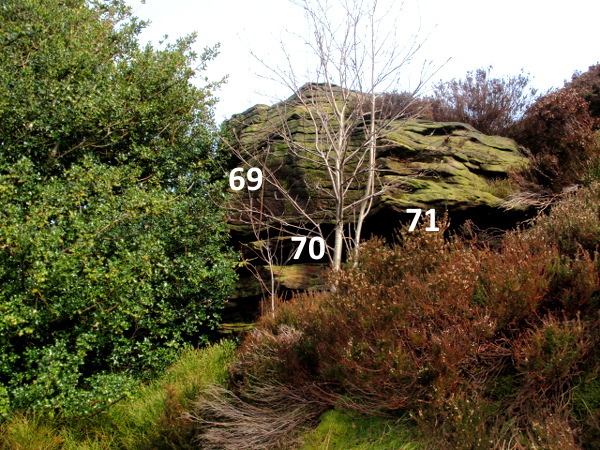 A better option might be to take a left after going under the bridge and head up the rough track towards the cricket club, park up just past it and walk across the scrub land to the bench next to the Sloping Top Boulder where you can descend easily to the crag. An easy to print PDF TOPO guide to all the problems and routes will be available soon. 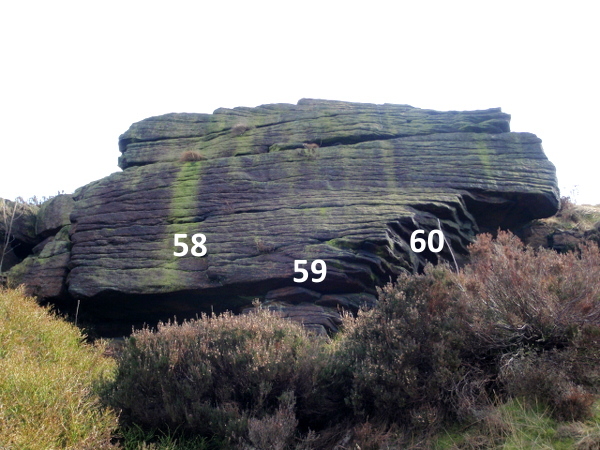 Hovering your mouse over, or clicking on, the name/grade of the problem/route will show the problem highlighted on the topo photograph below. 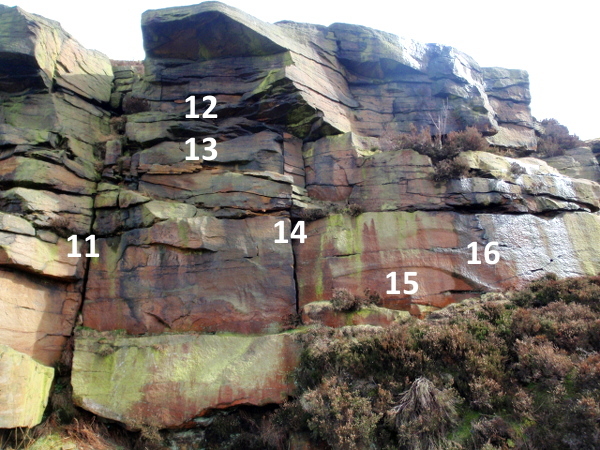 20) Skiver's Wall VS 5a Up the middle of the lower wall and the top side wall. 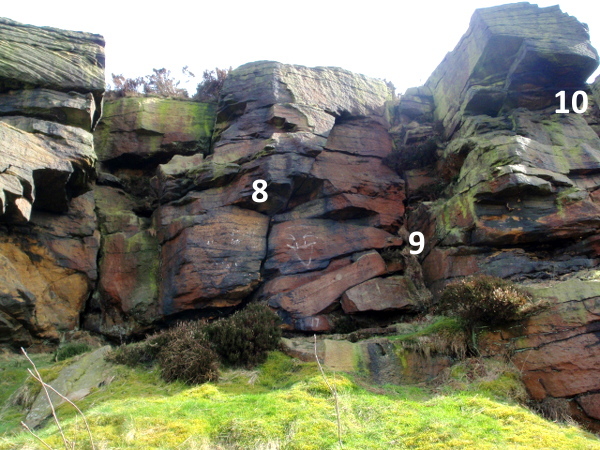 29) Bedstead Bay Route 8a HVS Left of the arete head upwards eliminating hold to the right of the arete and the obvious ledge to right. 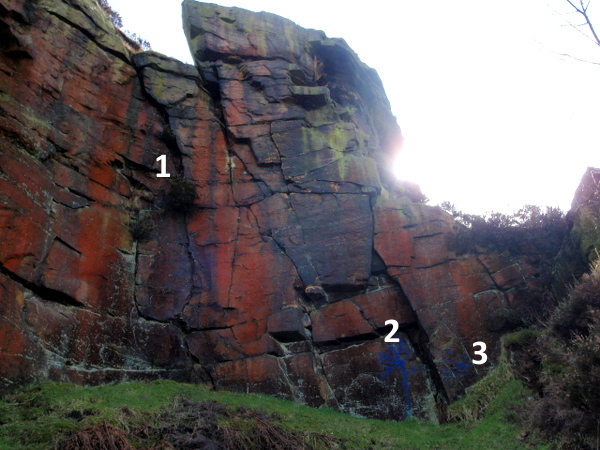 33) Booming Biltern 9b HVS 4c From the twin cracks head up then finish up the groove. 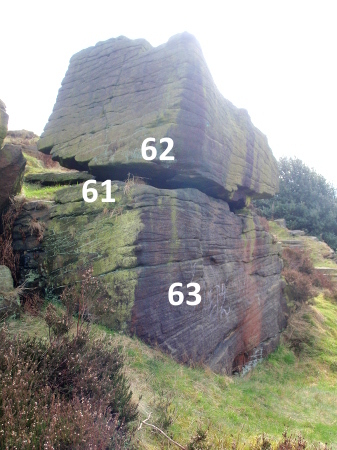 53) Squares - Font 4+ Just left of the overhang, climb the face via the two square holds from a sitting start. Font 3 from standing. 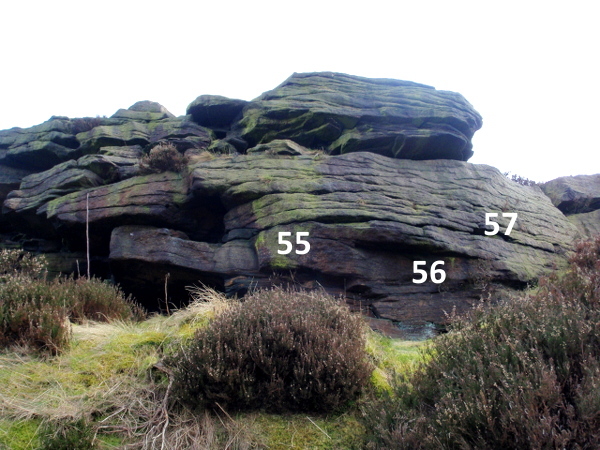 Thanks to Alex for his help with the photographs and checking the route & problem lines.